This superfood salad makes a great summery lunch, or serve it with grilled salmon or chicken breast for a healthy supper. 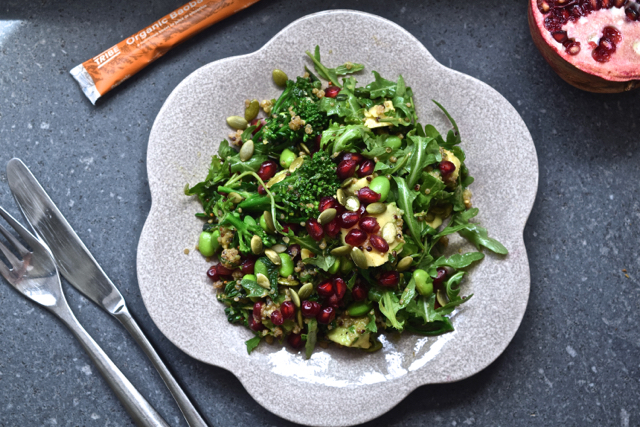 Add Tribe Baobab to supercharge the citrus dressing. continue to steam for another 2 minutes before removing from the heat. Whisk together dressing ingredients and put to one side. De-seed the pomegranate, then peel and roughly chop the avocados. Place the pomegranate seeds, avocados, quinoa, spinach, herbs, pumpkin seeds and steamed vegetables. Before serving, pour the dressing over the salad and toss well to cover it.